Position Your Device Exactly Where You Want - Used for Reading, Books, Music, Instrument Apps, Note Taking, Presentations, etc. 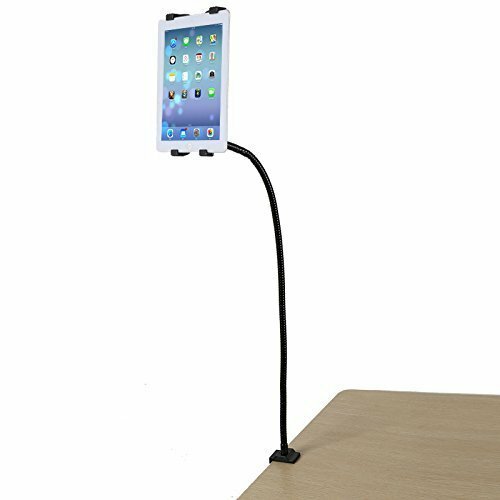 ;Securely Holds Any Tablet From 7 to 11 Inches - Quickly Mount and un-Mount Your Device - Perfect for the Home or Office.;Material:Steel. Overall length: 95cm, Hose length: 80cm. Weight: 2.34 lbs. ;For all 7-11 inch E-reader, Tablet. Rotation: 360 Deg. Dimensions: 17.13Lx16.73Wx20.87H. ;Swivel:360 Deg. Loading capacity 1KG.